Dr. Sarvepalli Radhakrishnan : What is his legacy for Indian education? How to define knowledge and wisdom? In remembrance of the Second President of India, the charismatic teacher Late Sarvepalli Radhakrishnan,we have designed this website. With hits from Saudi Arabia,Brazil, London, US and many parts of India.. the site is proving to be a success and we hope to make it a part of his legacy. Sarvepalli Radhakrishnan was born on September 5, 1888, at Tiruttani, forty miles to the north-east of Madras, in South India. He was born into a poor Brahmin family. His father Sarvepalli Veeraswami was employed on a meager salary in the zamindari. His mother's name was Sitamma. Radhakrishnan's father found it very difficult to educate his son with his meagre income. He also had a large family to take care of. But little Radhakrishnan was a brilliant boy. His father did not want him to learn English or go to school. Instead he wanted him to become a priest. However, the talents of the boy were so outstanding that his father finally decided to send him to school at Tiruttani itself. He was highly intelligent and he went through most of his education on scholarships. After his initial schooling in Tiruttani, he joined the Lutheran Mission School in Tirupati for his high school. When Radhakrishnan was 16 years old, he joined the Voorhee's College in Vellore. At the same age, his parents got him married to Sivakamuamma while he was still studying at Vellore. From Vellore he switched to the Madras Christian College at the age of 17. He chose philosophy as his major and attained a B.A. and M.A. in the field. "The thesis which he prepared in the second year of his study for this degree shows a remarkable understanding of the main aspects of the philosophical problems, a capacity for handling easily a complex argument besides more than the average mastery of good English". "Religious feeling must establish itself as a rational way of living. If ever the spirit is to be at home in this world, and not merely a prisoner or a fugitive, spiritual foundations must be laid deep and preserved worthily. Religion must express itself in reasonable thought, fruitful action and right social institutions." In April 1909, he was appointed to the Department of Philosophy at the Madras Presidency College. From then on, he was engaged in the serious study of Indian philosophy and religion, and was a teacher of Philosophy. In 1918, he was appointed Professor of Philosophy in the University of Mysore. Three years later, he was appointed to the most important philosophy chair in India, King George V Chair of Mental and Moral Science in the University of Calcutta. Radhakrishnan represented University of Calcutta at the Congress of the Universities of the British Empire in June 1926 and the International Congress of Philosophy at the Harvard University in September 1926. At the Philosophical Congress held at Harvard University, the lack of spiritual note in modern civilization was the focus of his address to the general meeting. "It was a great experience for me to preach from Christian pulpits in Oxford and Birmingham, in Manchester and Liverpool. It heartened me to know that my addresses were liked by Christian audiences. Referring to my sermon on "Revolution through Suffering", an Oxford daily observed, "Though the Indian preacher had the marvelous power to weave a magic web of thought, imagination and language, the real greatness of his sermon resides in some indefinable spiritual quality which arrests attention, moves the heart and lifts us into an ampler air." He was the Vice-Chancellor of Andhra University from 1931 to 1936. From 1936-39, Radhakrishnan was the Spalding Professor of Eastern Religions and Ethics at Oxford University. In 1939, he was elected Fellow of the British Academy. From 1939-48, he was the Vice-Chancellor of the Banaras Hindu University. He later held offices that dealt with India's national and international affairs. He was the leader of the Indian delegation to UNESCO during 1946-52. He was the Ambassador of India to U.S.S.R. during 1949-52. He was the Vice-President of India from 1952-1962 and the President, General Conference of UNESCO from 1952-54. He held the office of the Chancellor, University of Delhi, from 1953-62. From May 1962 to May 1967, he was the President of India. Aldous Huxley observed that Dr. Radhakrishnan "is the master of words and no words." Prof. H.N. Muirhead said, "Dr. Radhakrishnan has the rare qualification of being equally versed in the great European and the not less great Asiatic tradition which may be said to hold in solution between them the spiritual wisdom of the world, and of thus speaking as a philosophical bi linguist upon it." George P. Conger said, "Among the philosophers of our time, no one has achieved so much in so many fields as has Sarvepalli Radhakrishnan of India ... William James was influential in religion, and John Dewey has been a force in politics. One or two American philosophers have been legislators. Jacques Maritain has been an ambassador. Radhakrishnan, in a little more than thirty years of work, has done all these things and more... Never in the history of philosophy has there been quite such a world-figure. With his unique appointment at Banaras and Oxford, like a weaver's shuttle, he has gone to and fro between the East and West, carrying a thread of understanding, weaving it into the fabric of civilization." Sarvepalli Radhakrishnan passed away on April 17, 1975. In India, September 5 (his birthday) is celebrated as Teacher's Day in his honor. Radhakrishnan along with Ghanshyam Das Birla and a few other Social Workers in the pre-independence era formed Krishnarpan Charity Trust. 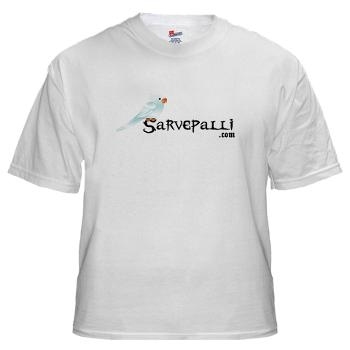 Introducing " Sarvepalli Online Store"
Download our Latest "Sarvepalli Toolbar"